BioWare bosses Ray Muzyka and Mass Effect 2 Executive Producer Casey Hudson explained why ME2 lacks any homosexual relationships. BioWare's sci-fi epic Mass Effect 2 has come under fire for not having the option of homosexual relationships, unlike BioWare's other recent release Dragon Age: Origins. Tracey John asked Casey Hudson and Ray Muzyka at GDC this year exactly why Mass Effect 2 lacked these relationships, and the answers they gave were interesting, and actually slightly different from each other. 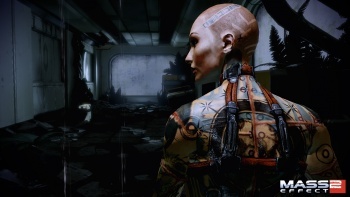 According to Hudson, it was not only a question of time and effort, because BioWare didn't want to just reuse the same scene but with different characters, but also that it didn't fit with the general level of maturity BioWare wanted for the game. "We still view it as... if you're picturing a PG-13 action movie," he said. "That's how we're trying to design it. So that's why the love interest is relatively light." Muzyka had a slightly different view however, saying that a homosexual Shepard didn't fit with BioWare's concept of the character: "Sometimes, in some of our games, we are going to have a defined character with a more defined view. Almost like a third-person narrative -- where Mass Effect is more in that vein, Dragon Age isn't in that vein ... For some other franchises we've had more defined characters and sort of approaches to things, and they've had a more defined personality and a more defined approach to the way they've proceed through the game and the world." Two slightly different answers, but both essentially saying the same thing, that homosexuality wasn't part of the vision that BioWare had for the game. There seems to some subtext there that no one is saying, namely that the inclusion of actual homosexual relationships might hurt sales, but that is a very different issue and one that will take more than one science-fiction videogame to tackle.